With the New Year looming it's time to bust out the mid-season replacements to plug the holes in the television schedules caused by the shows that didn't quite rise to the occasion this Fall. It always amazes Daily Billboard how much money the studios spend to launch fledgling shows and a vast majority of them don't seem to last beyond three to six episodes. 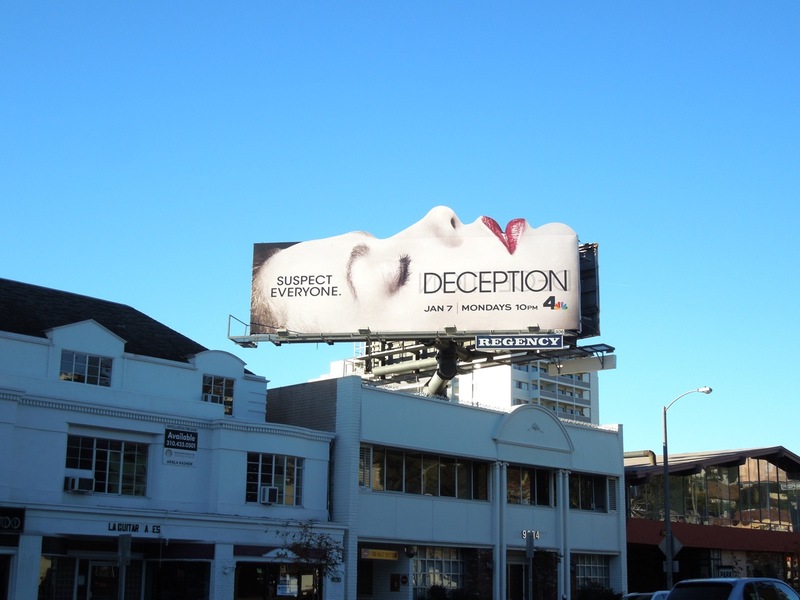 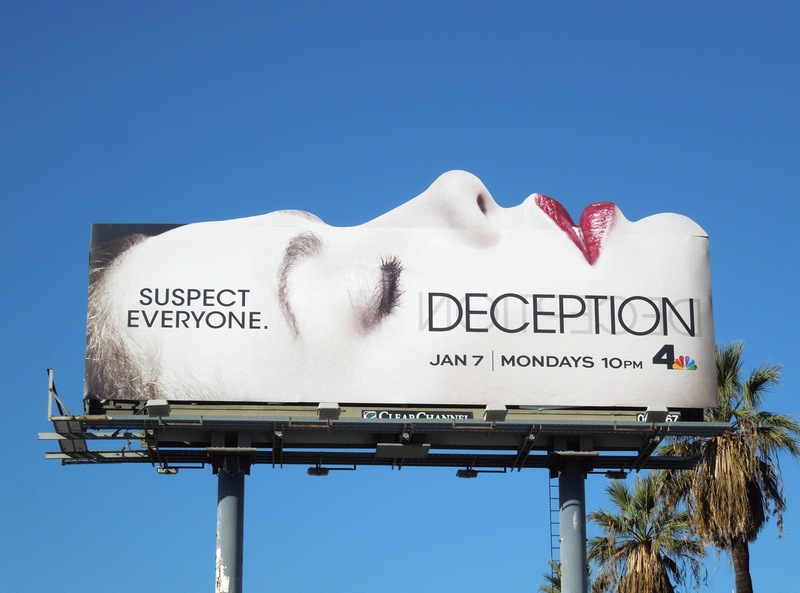 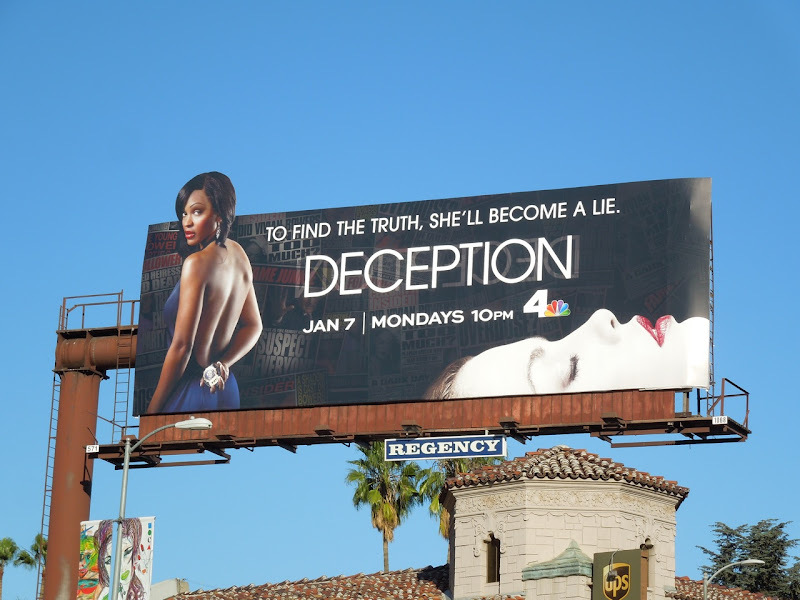 Hopefully NBC's Deception can buck this trend because these special extension billboards are certainly intriguing advertisements for the new crime drama. 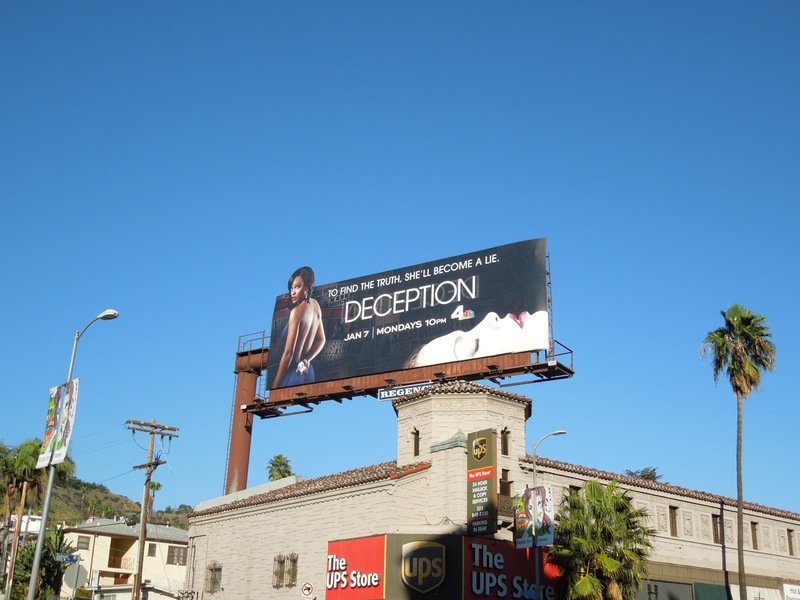 Meagan Good's female 'Detective Joanna Locasto' is forced to go undercover to find the killer when her wealthy socialite friend is murdered. 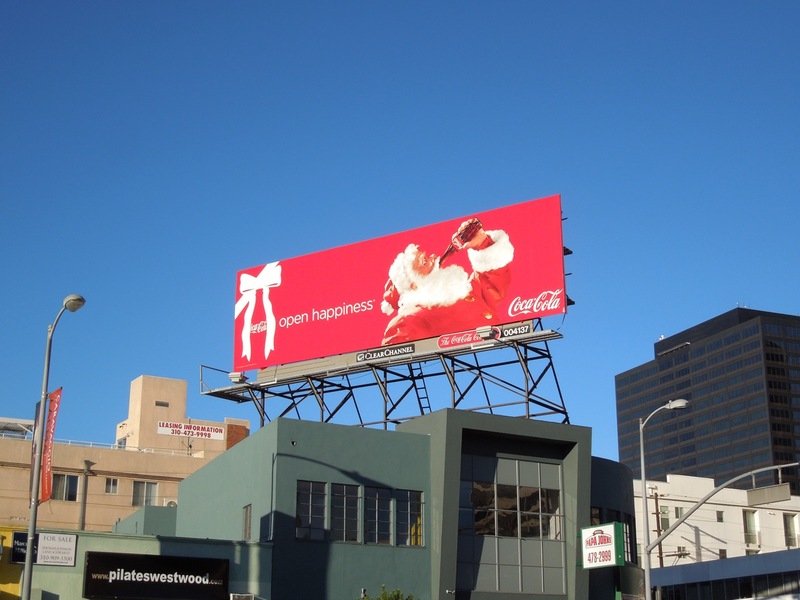 These special extension creatives really are quite eye-catching, especially at this time of year when there are not so many gimmicky billboards filling the skies. 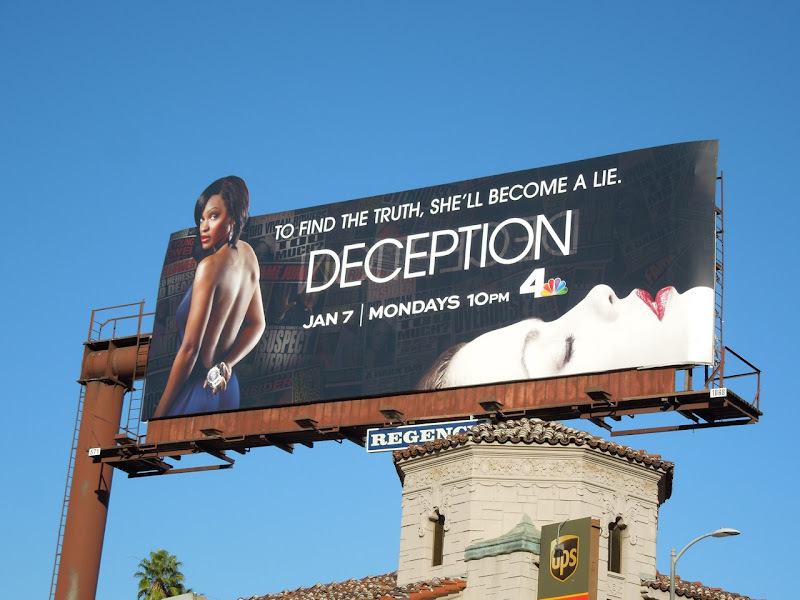 The 'To find the truth. 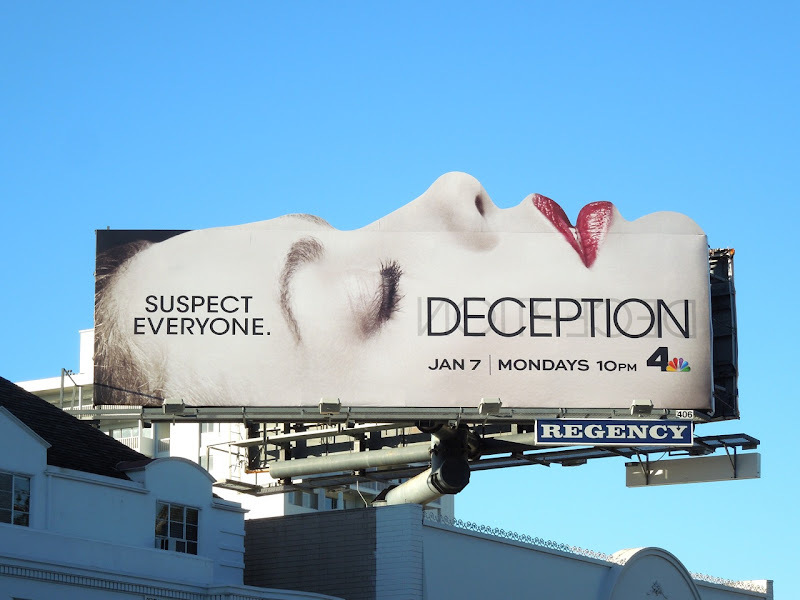 She'll become a lie' creative was snapped along Sunset Boulevard and Cahuenga Boulevard on December 19, whilst the 'Suspect everyone' face special extension was spotted along the Sunset Strip on December 21, 2012. 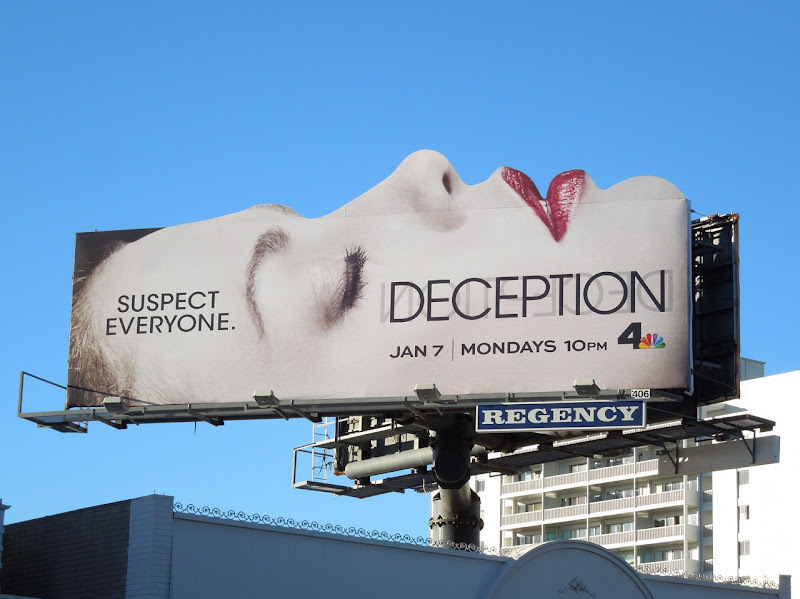 Here's wishing you a fun-filled New Year's Eve whatever you get up to, and stick around to usher in 2013 with a fresh and fabulous new TV WEEK. 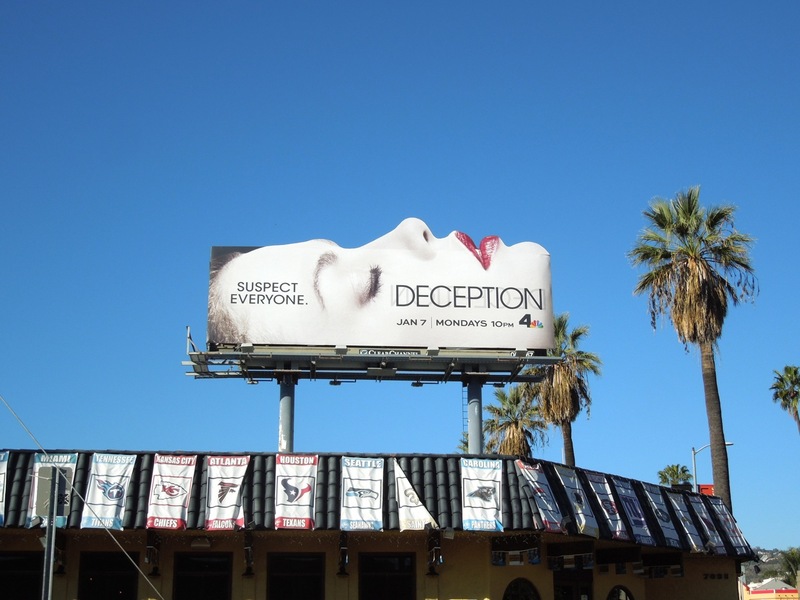 UPDATED: Here's another of the face special extension billboards photographed in better lighting to really celebrate the impact of the arresting visual. 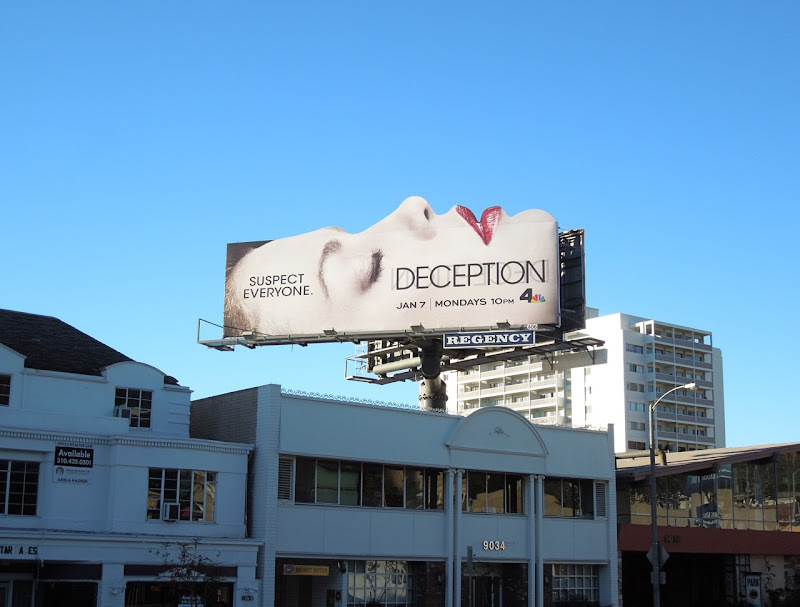 This version was photographed above The Happy Ending Bar and Restaurant along Sunset Boulevard in Hollywood on January 2, 2013. 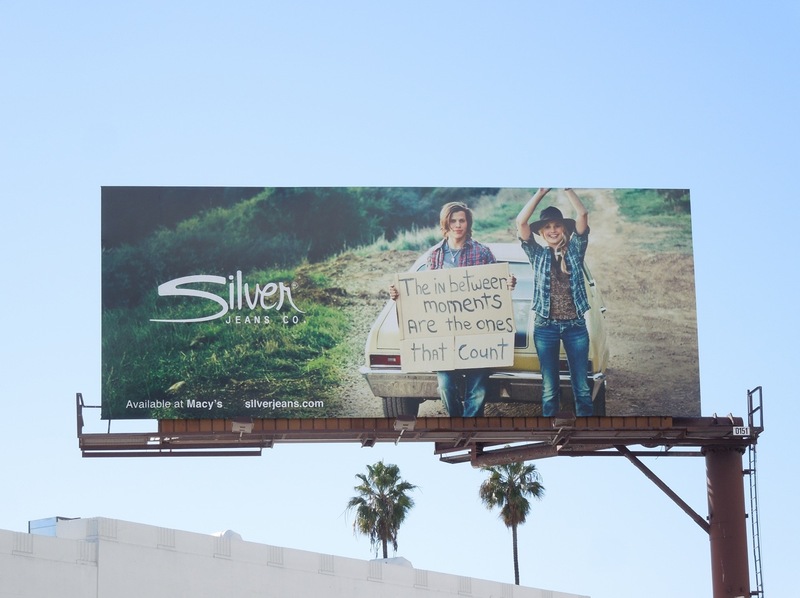 As 2012 draws to a close, Daily Billboard couldn't help but be drawn to this philosophical billboard from Silver Jeans Co. 'The in between moments are the ones that count', indeed. 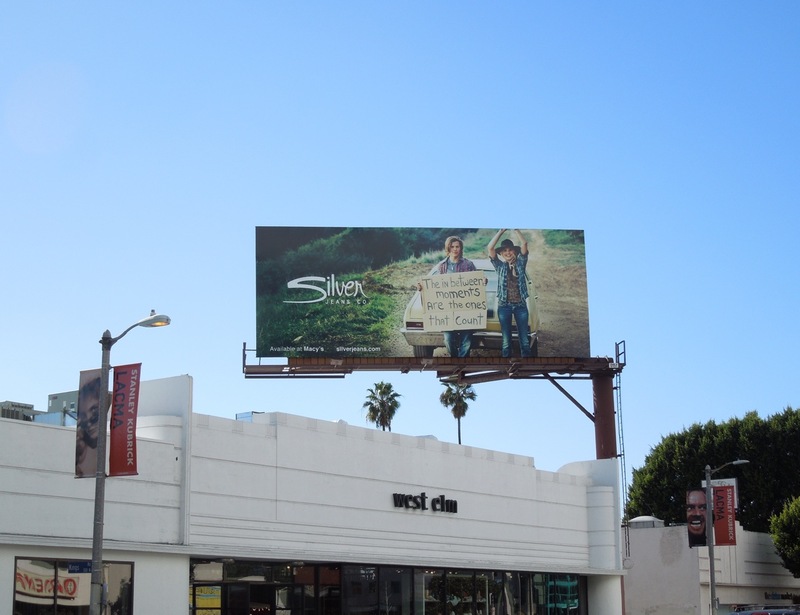 A seemingly new addition to the skies of L.A. this year, the jeans brand certainly has a way of catching your eye with its fresh faced creatives. 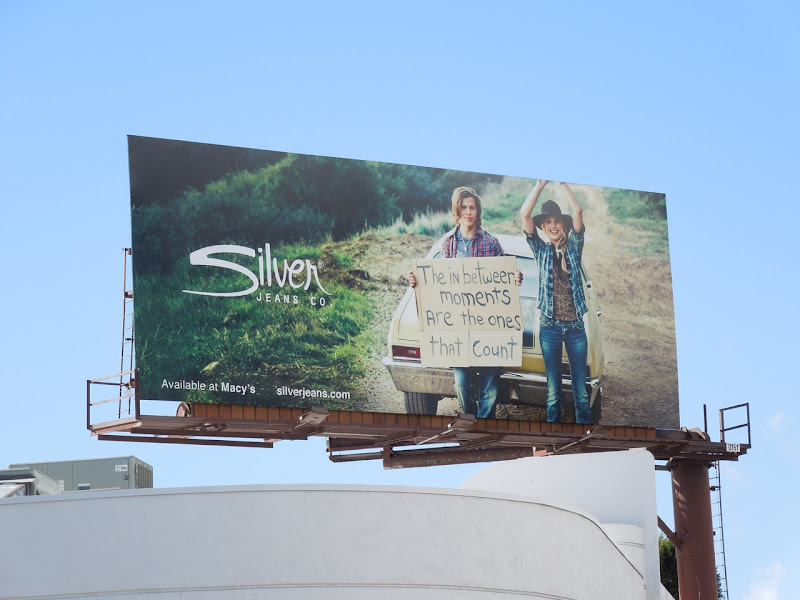 These billboards were spied along Beverly Boulevard just before The Beverly Center on May 5 with the denim shorts creative, on July 24 for the sun's rays version and with the latest cardboard sign creative on December 18, 2012. 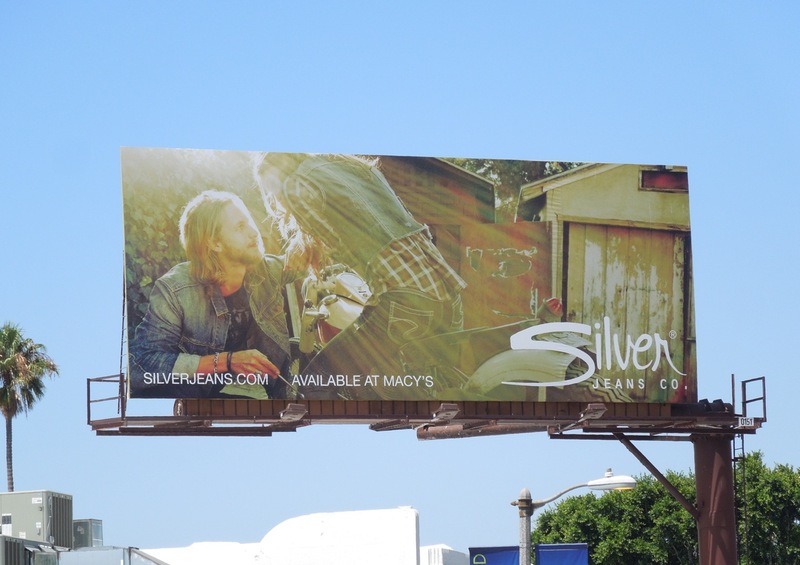 If you're a fashionista, you'll also want to check out more stylish jeans billboards here at Daily Billboard. 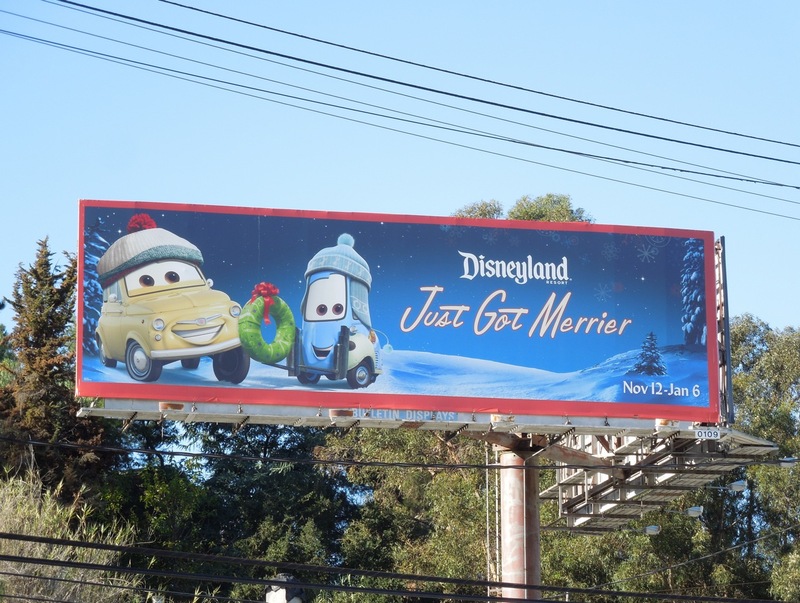 And like the ad says, be sure to make all your moments count. 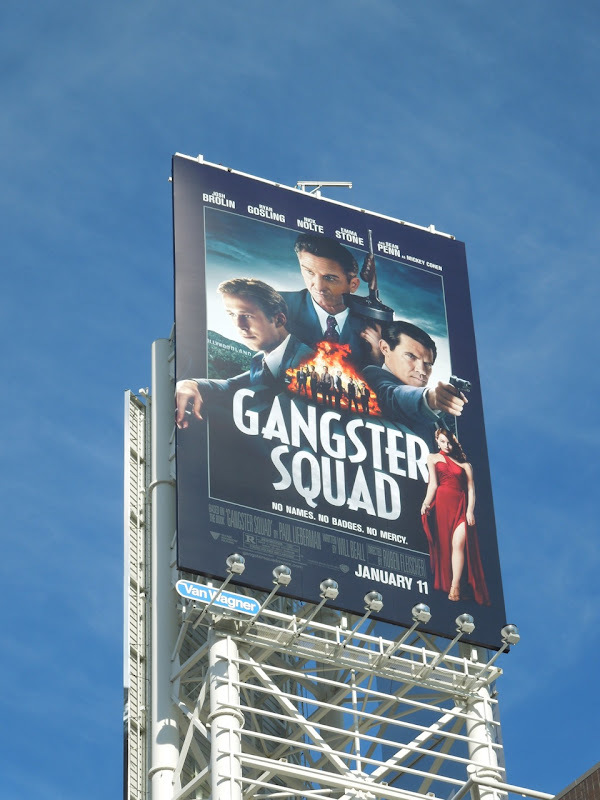 Now that the Holidays are drawing to a close and the New Year is looming, it's time to get back to the business of movies. 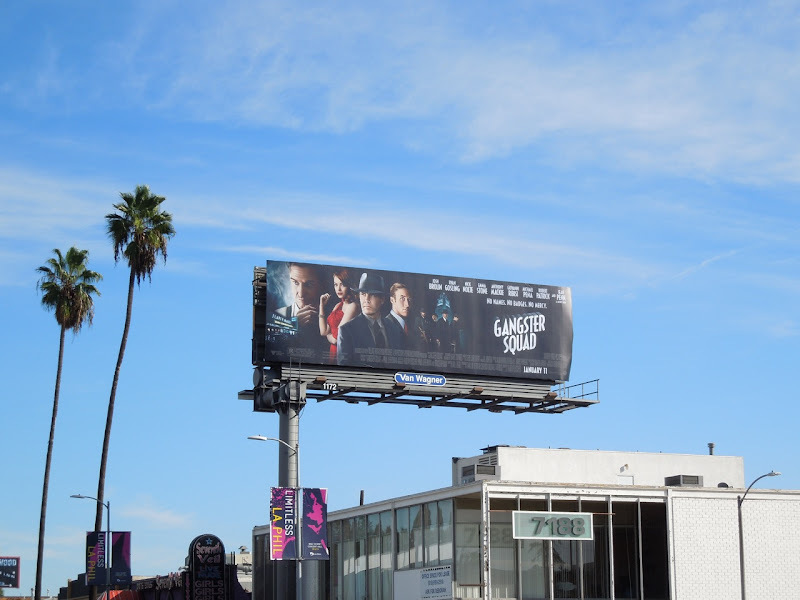 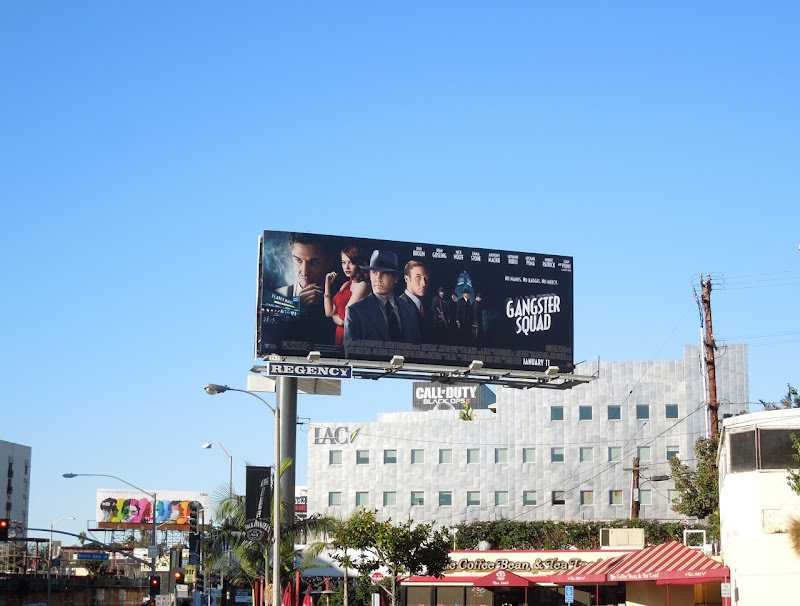 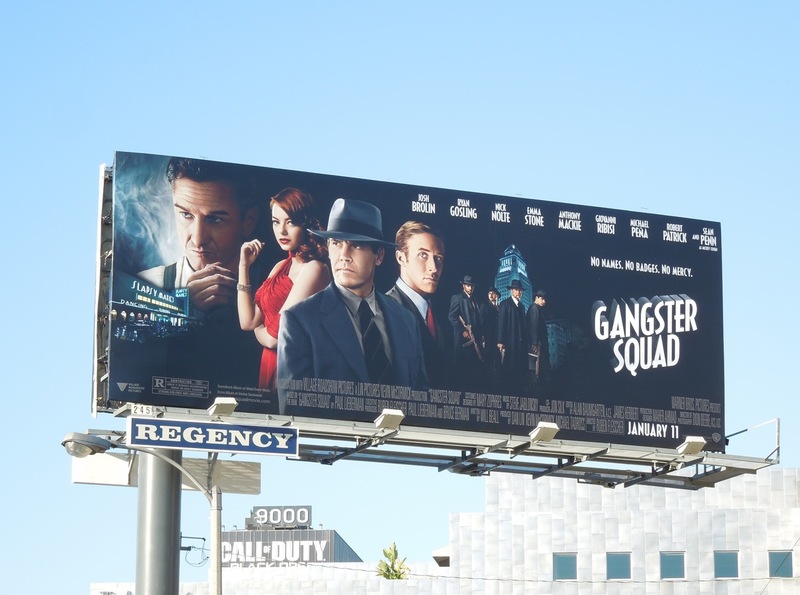 This month these evocative Gangster Squad billboards have overtaken the skies of Los Angeles. 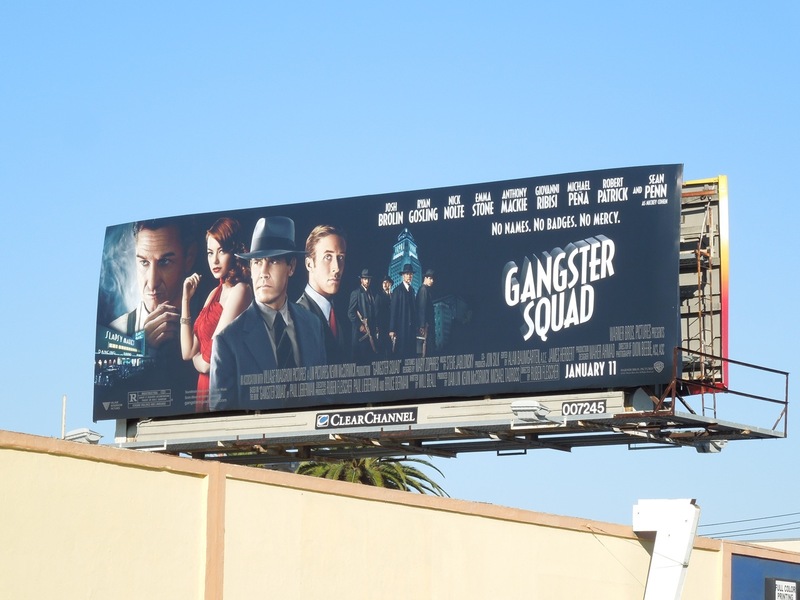 Originally due for a September 2012 release, the similarities between the horrific Aurora theatre shootings and a scene in the period gangster movie required re-shoots and resulted in a delayed release date of January 2013. 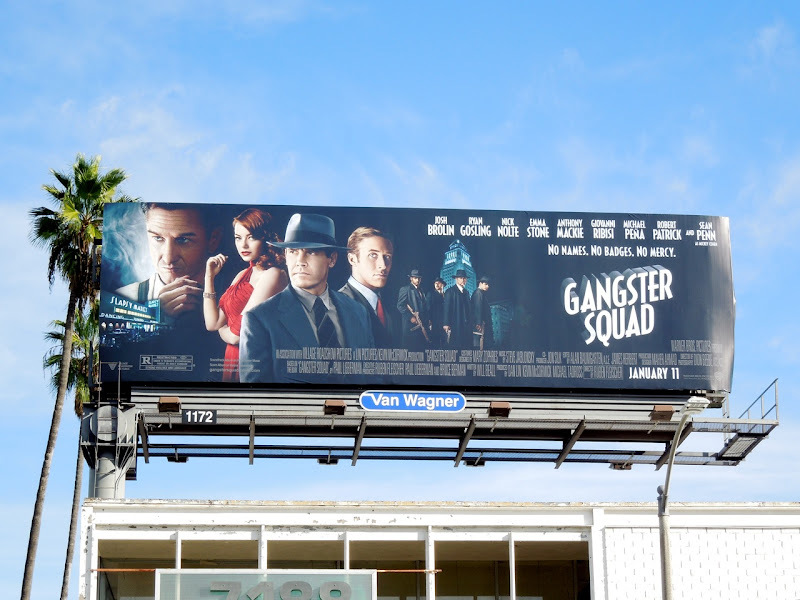 Set in 1940's and 1950's L.A., the film centers around a rogue cop squad trying to stop East Coast Mafia types led by Sean Penn's underworld boss, 'Mickey Cohen', from invading the City of Angels. 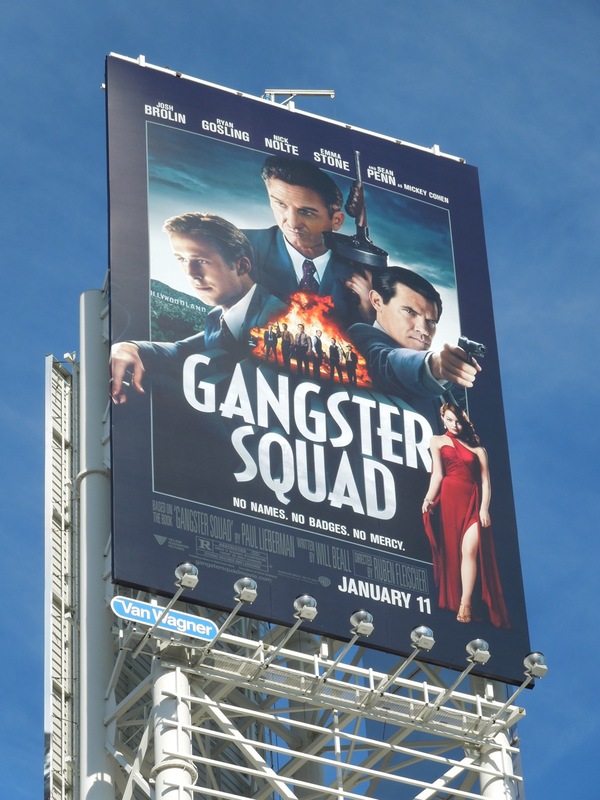 Josh Brolin leads the LAPD officers operating outside the law and the crime flick sees him butting heads with Sean Penn again, just like he did in Milk. 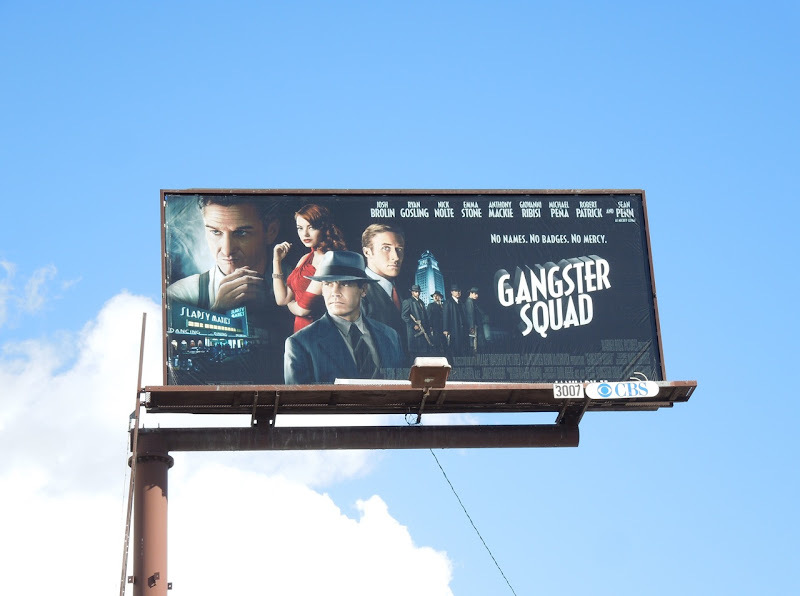 Meanwhile Emma Stone and Ryan Gosling find themselves getting romantic again and hopefully sharing that same on screen chemistry they had in Crazy Stupid Love. 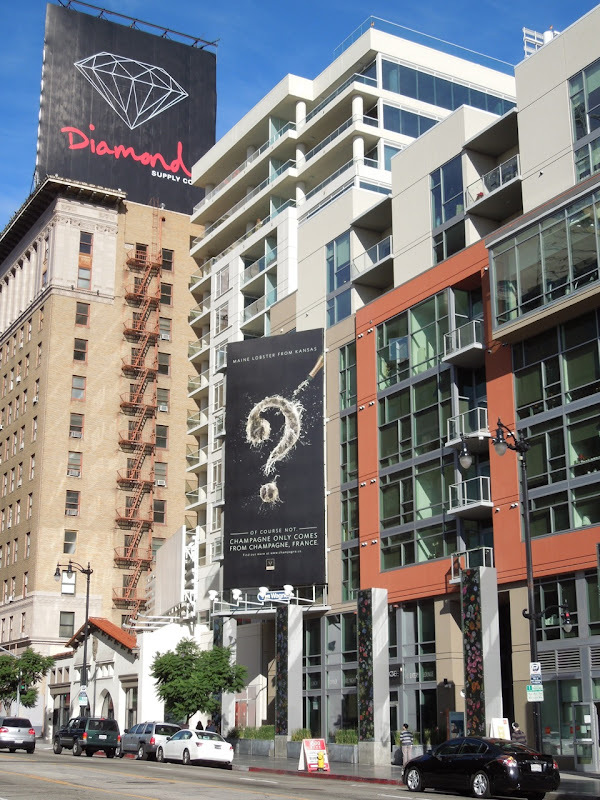 on display at the Petersen Automotive Museum. 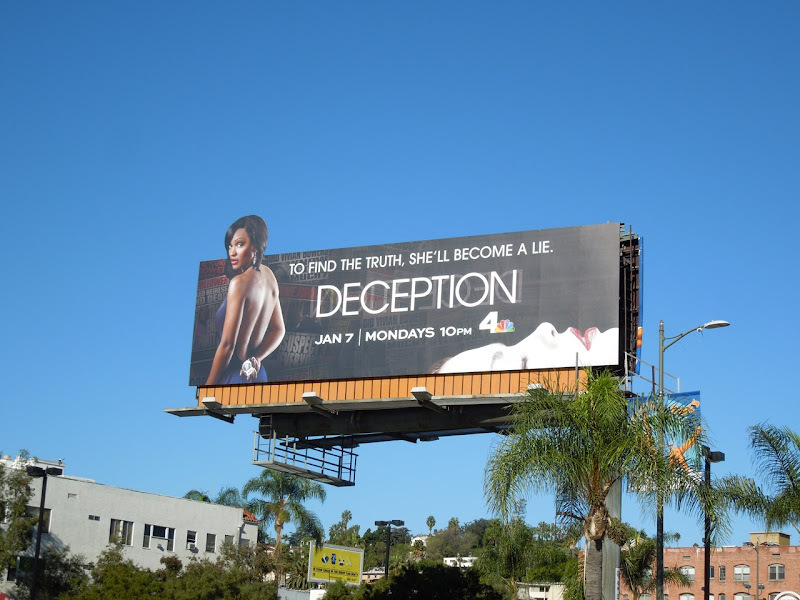 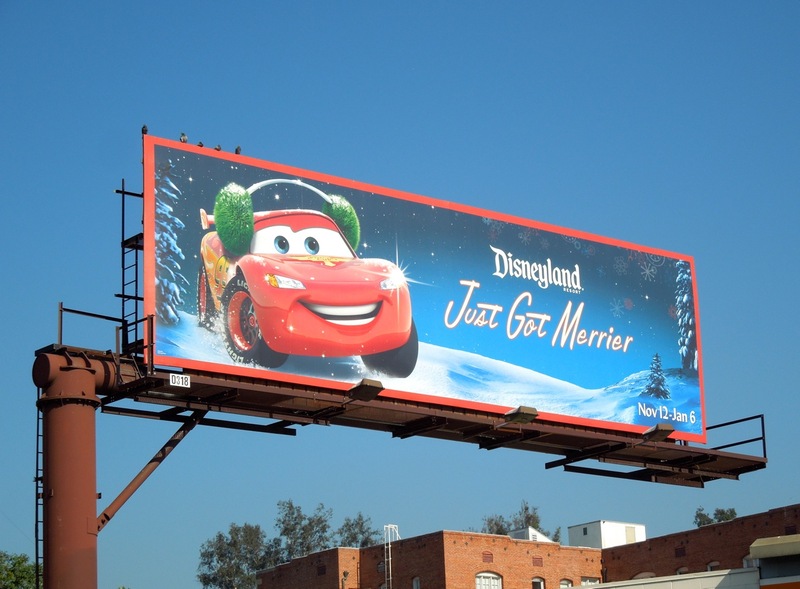 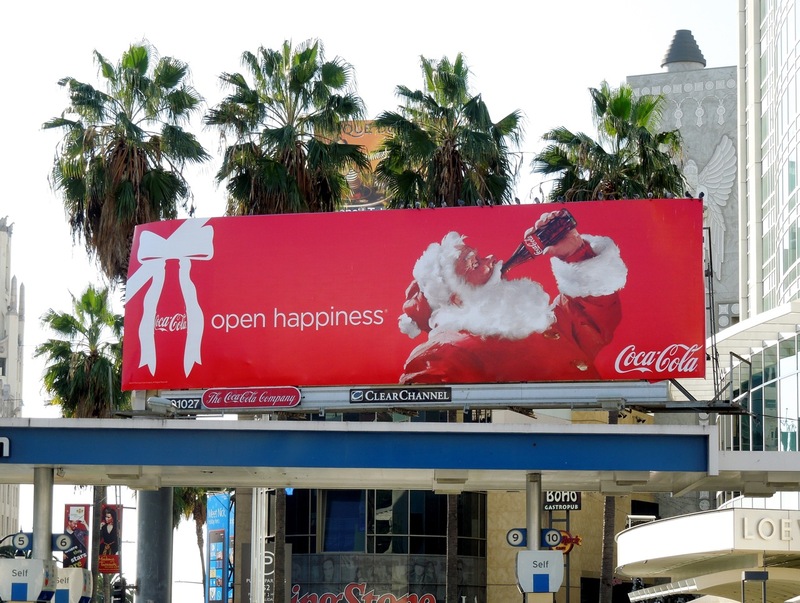 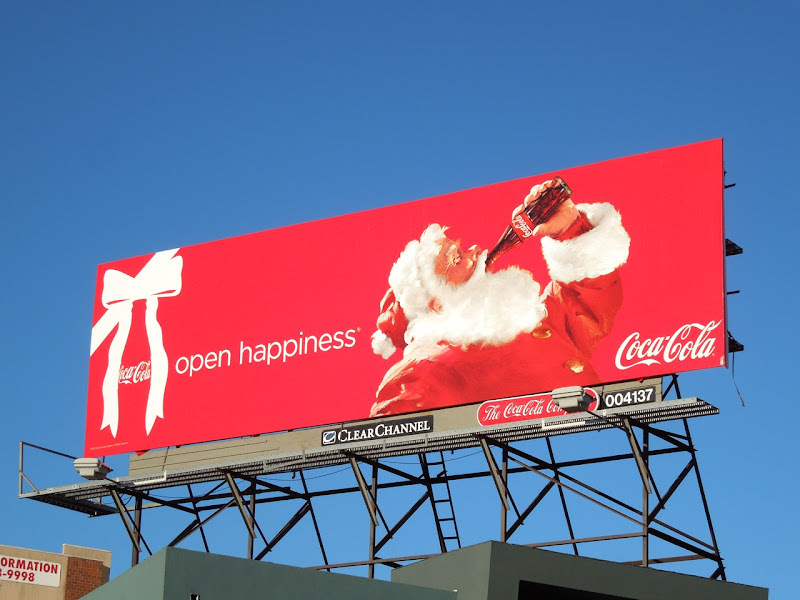 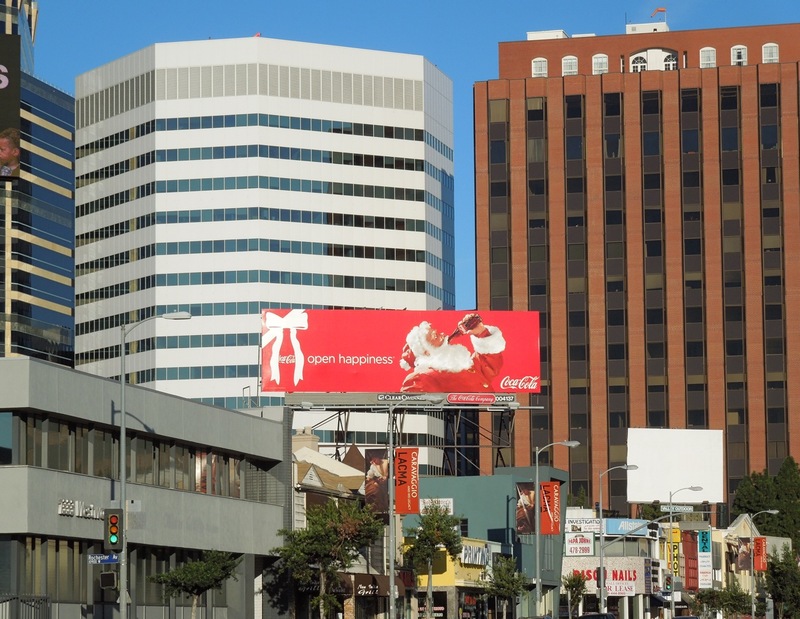 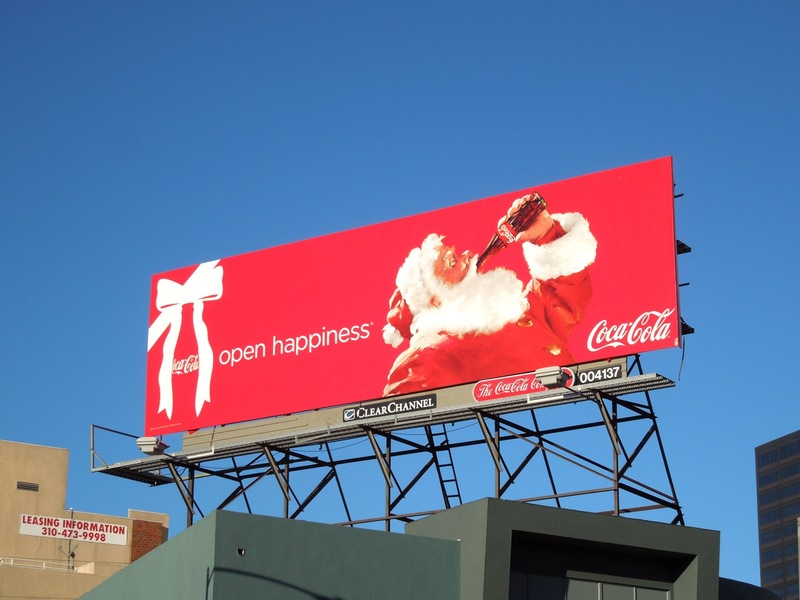 These billboards were snapped all over the streets of L.A., along La Cienega Boulevard, Sunset Boulevard, Beverly Boulevard and even high above Sunset & Vine from December 14 to December 19, 2012. 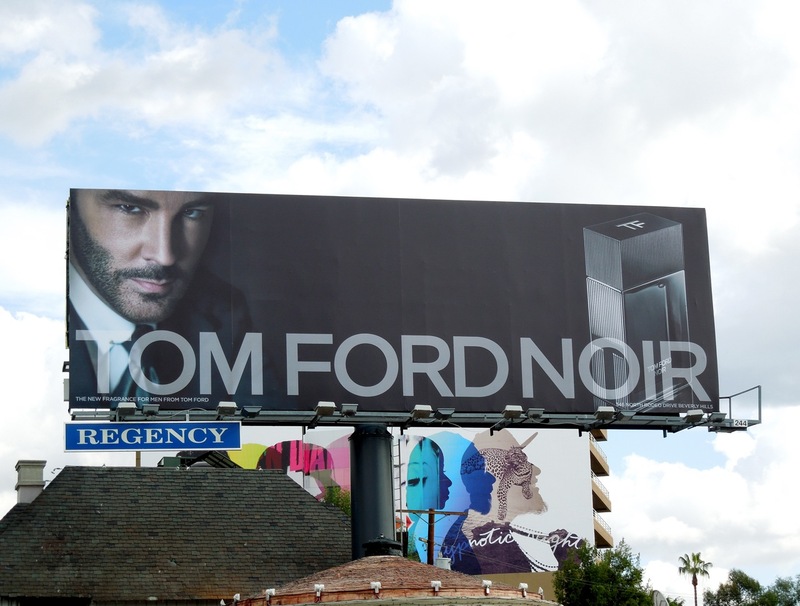 Hopefully Santa was kind to you, and maybe some of you even received this new men's fragrance from Tom Ford in your Christmas stocking to keep you smelling stylish all year long. 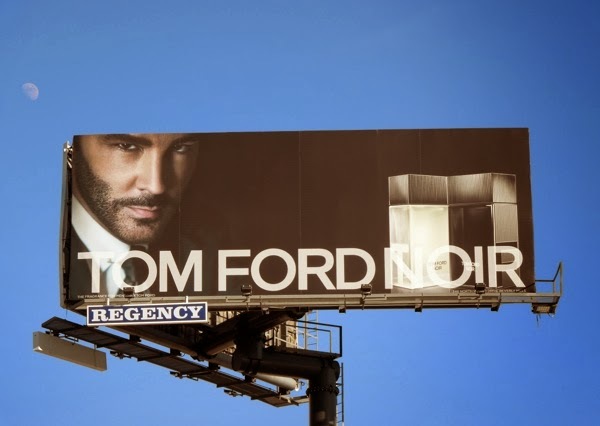 Tom Ford certainly must save himself a boat load of money by being handsome enough to model for his own products, although let's face it, he is the living embodiment of his brand, which you can't always say about a fashion designer. 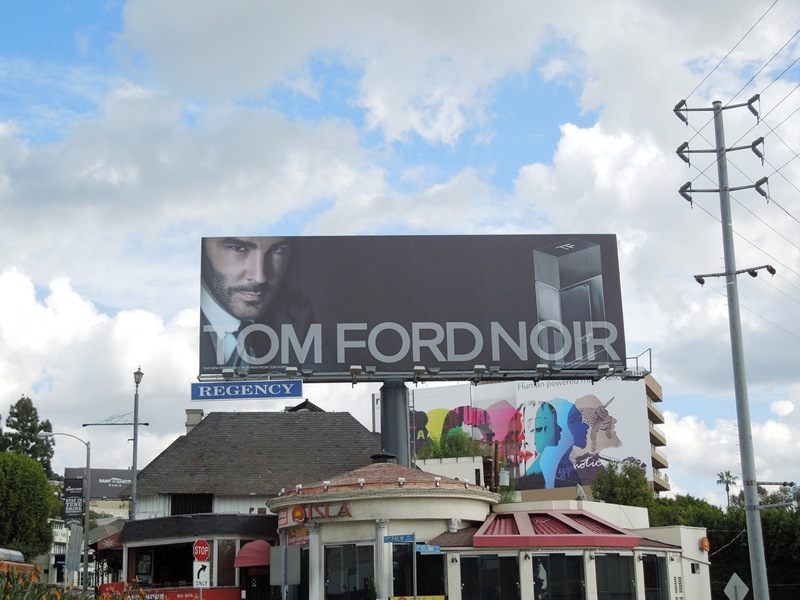 This smouldering Tom Ford Noir creative was snapped along Sunset Boulevard on cloudy December 14, 2012. 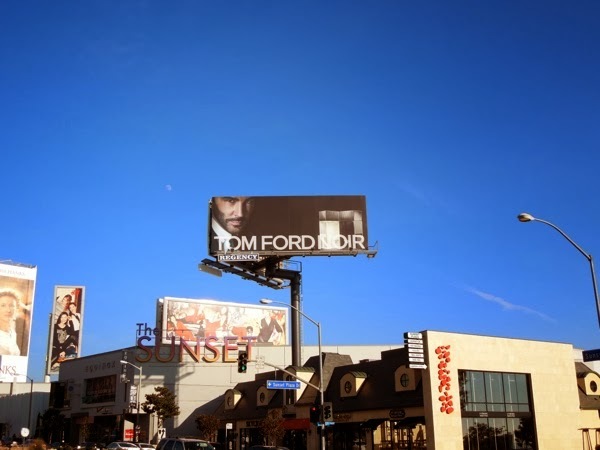 If you're a fan of the fashion brand, be sure to check out these other super stylish Tom Ford billboards. 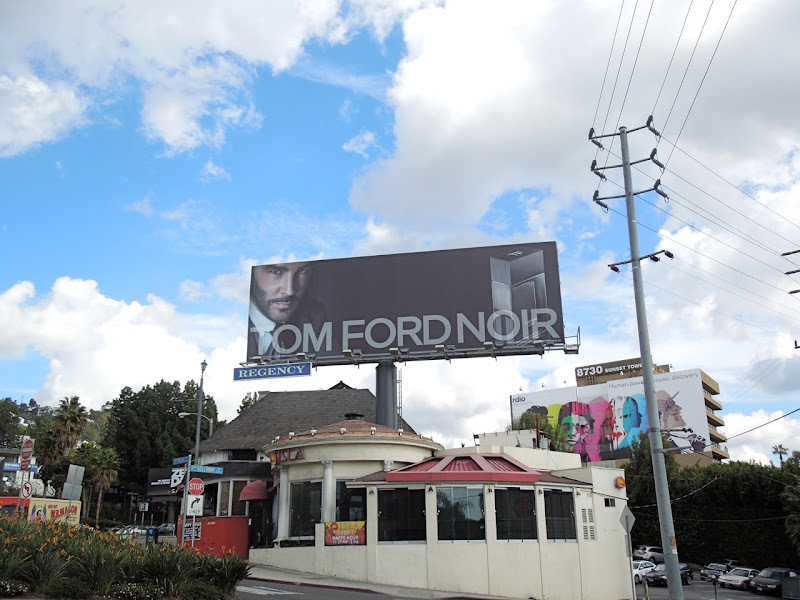 UPDATED: Fast forward to 2014 and Tom Ford has a new billboard for his designer Noir fragrance for the sophisticated Tom Ford man, now available in Eau de Parfum and Eau de Toilette spray (hence the two bottles). 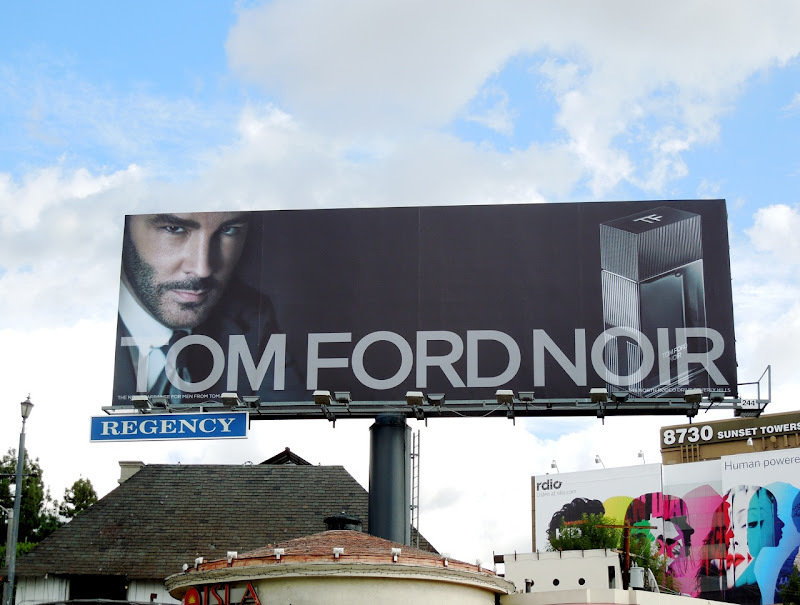 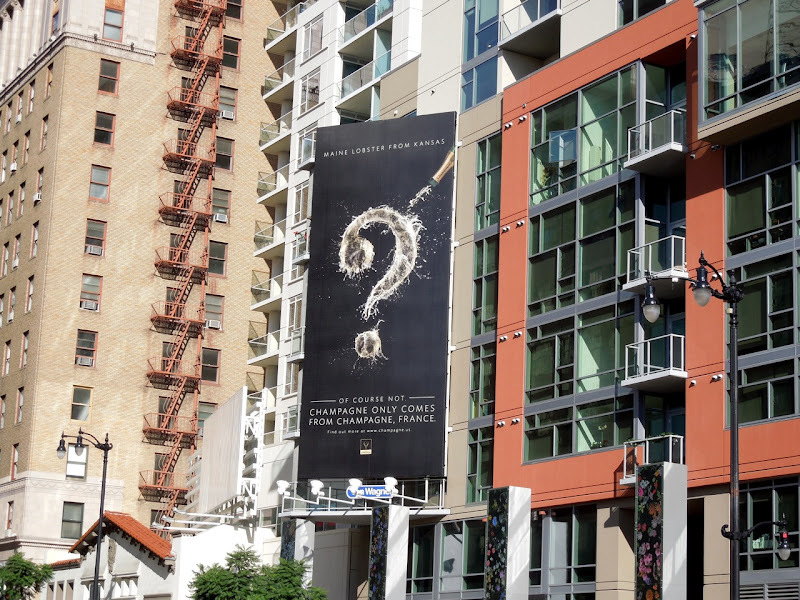 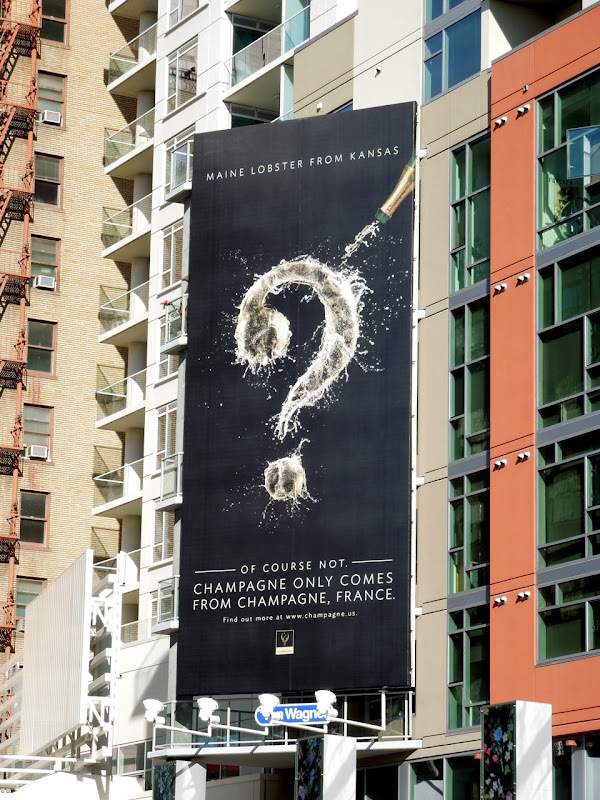 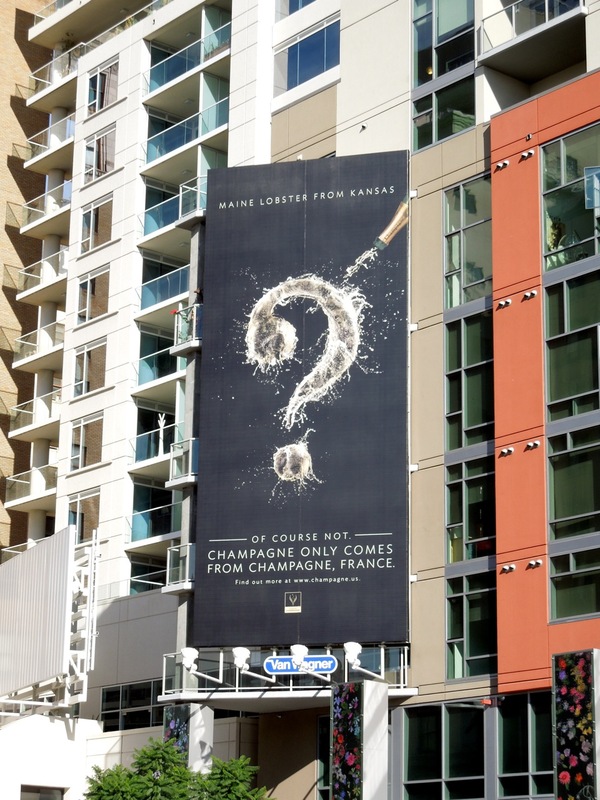 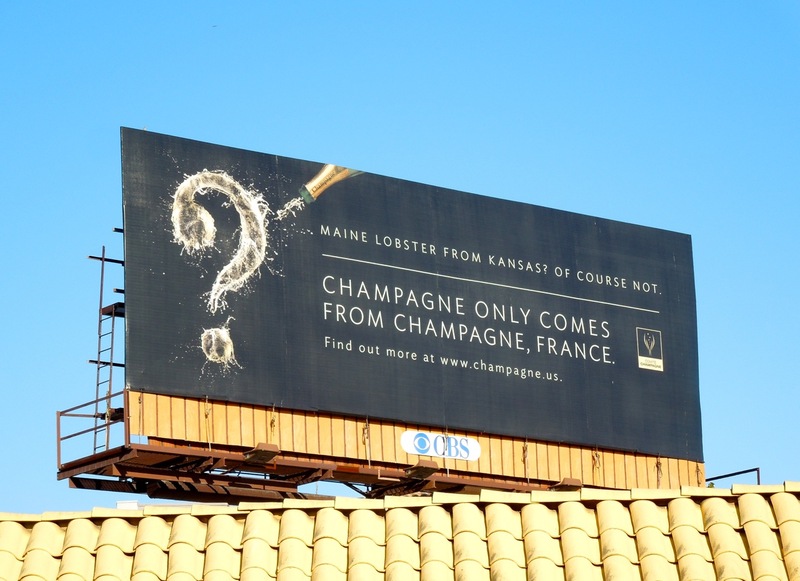 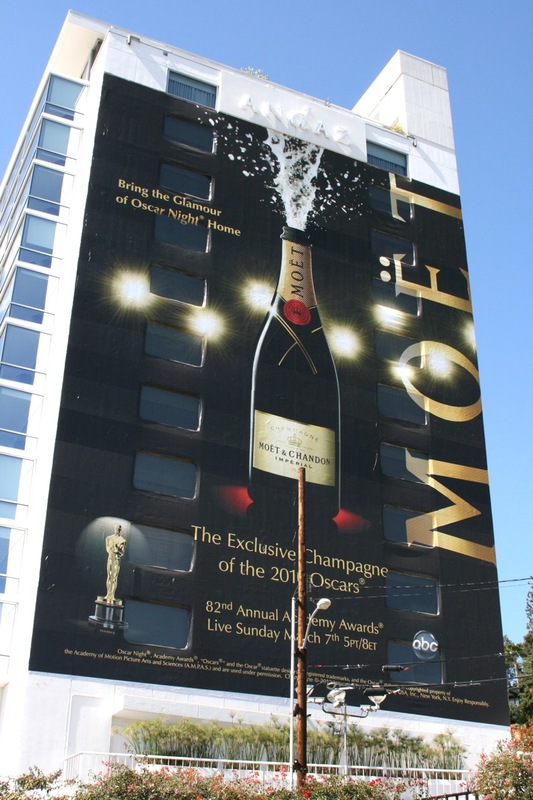 This updated stylish billboard was snapped along L.A.'s Sunset Plaza on January 10, 2014. What movie are you in the mood for on the big screen this Christmas? 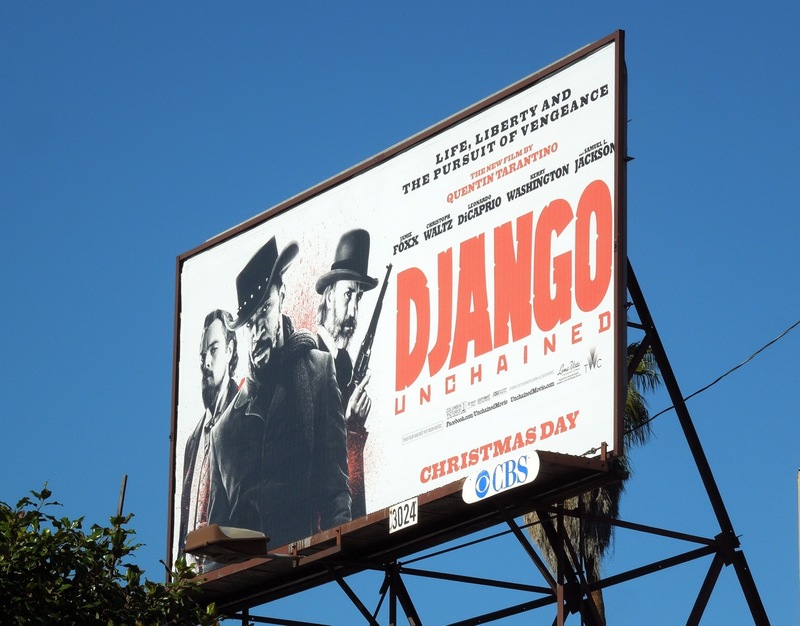 Will it be an epic revolutionary musical like Les Misérables, or a bloody Western in the form of Django Unchained, brought to you by the mind of Quentin Tarantino. 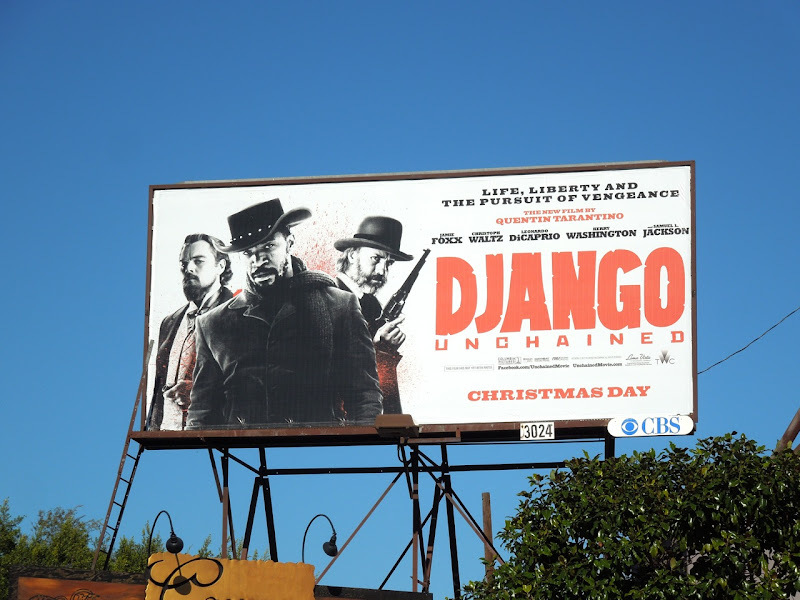 Jamie Foxx stars in this tale of revenge as a slave turned bounty-hunter, out to rescue his wife (Scandal's Kerry Washington) from a brutal Mississippi plantation owner, in what promises to be a wild, wild ride. 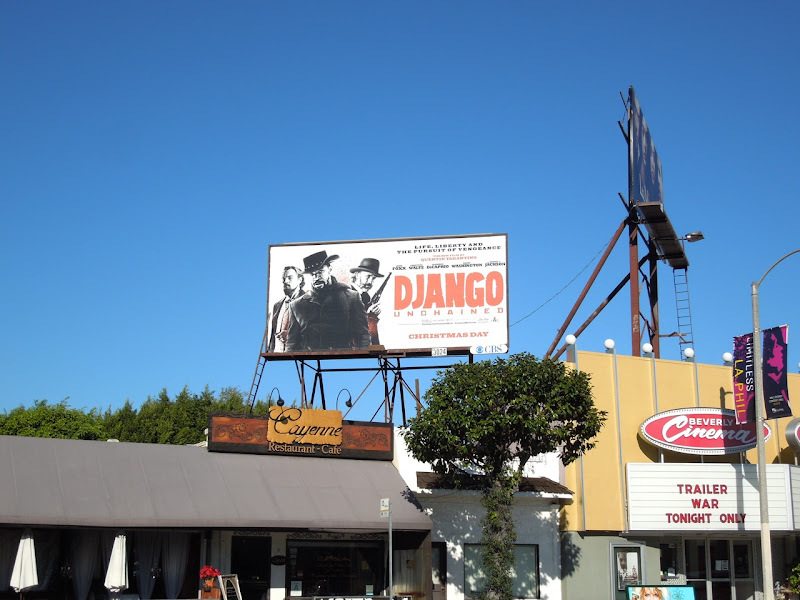 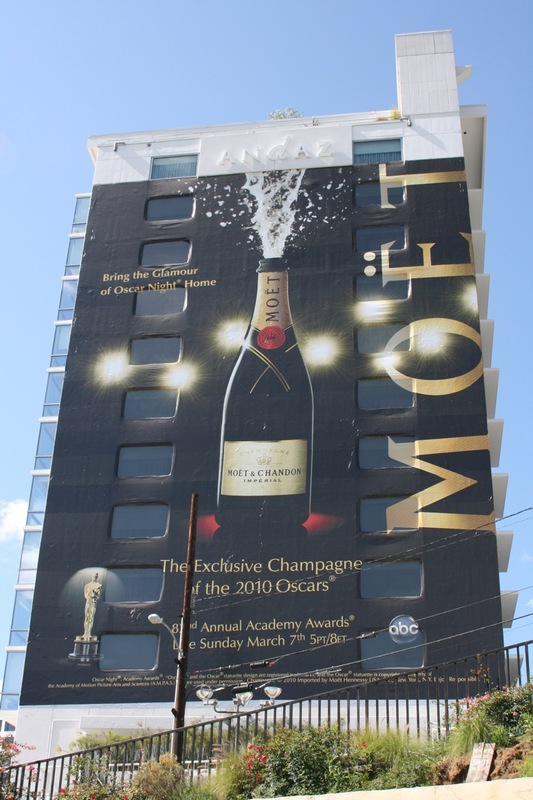 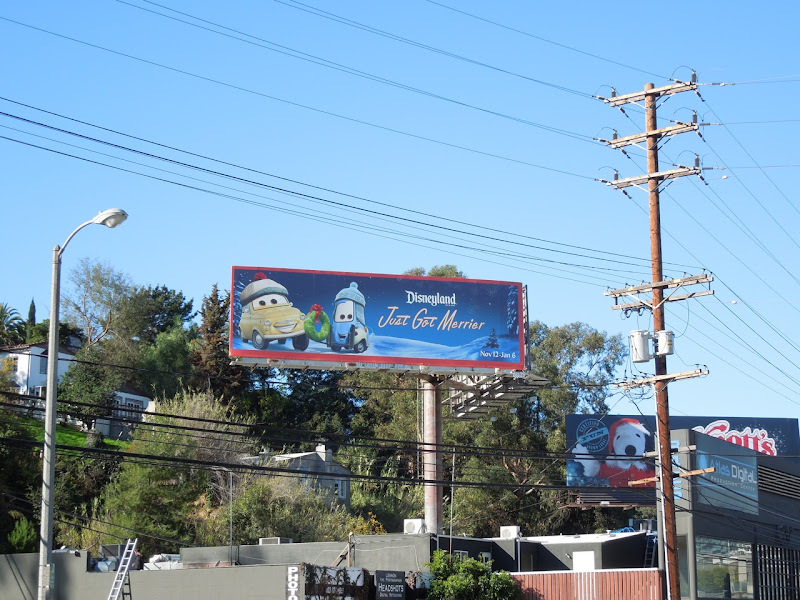 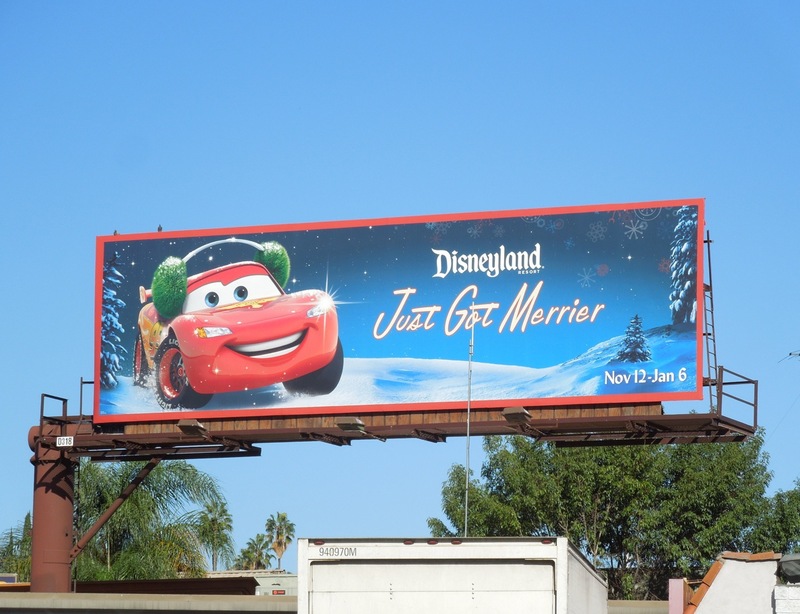 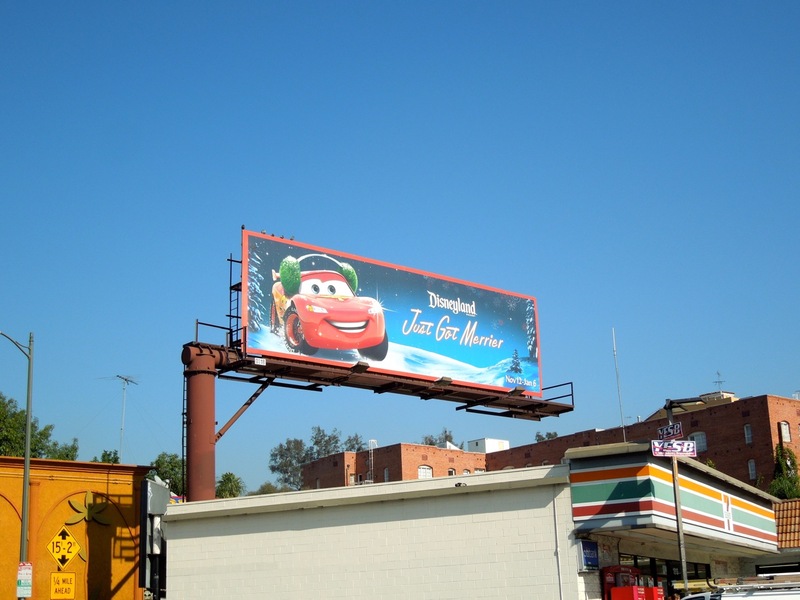 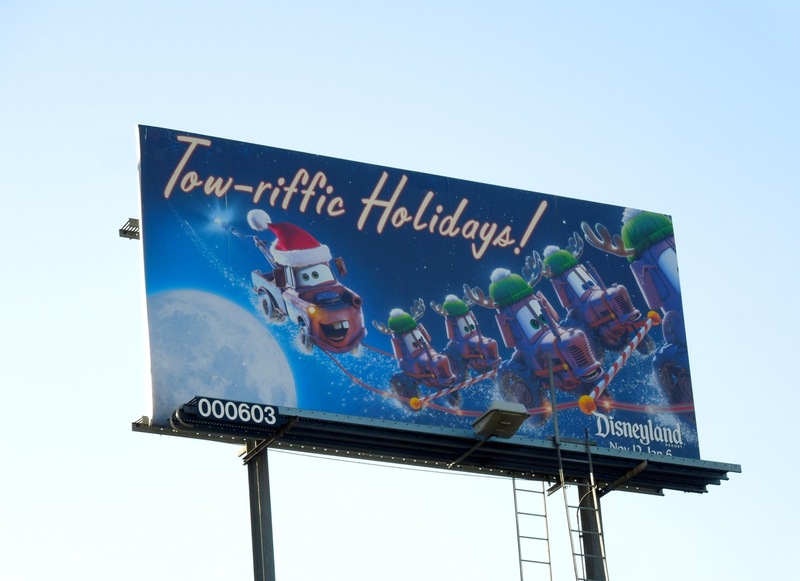 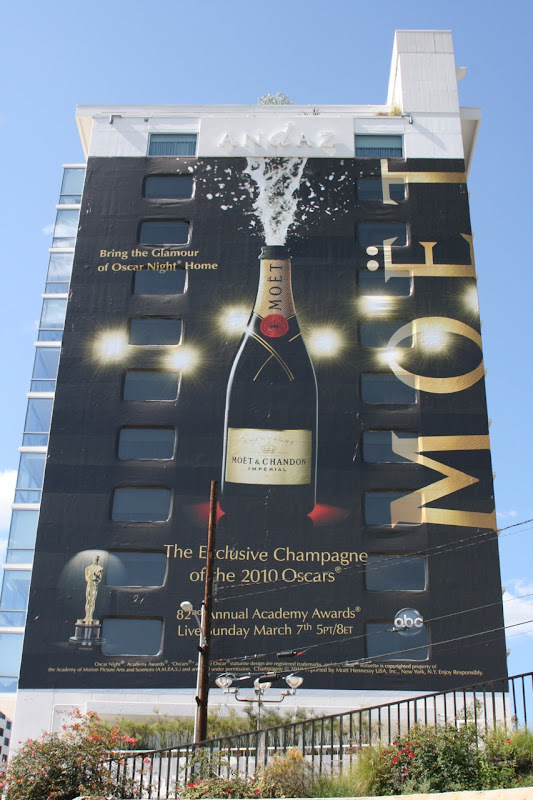 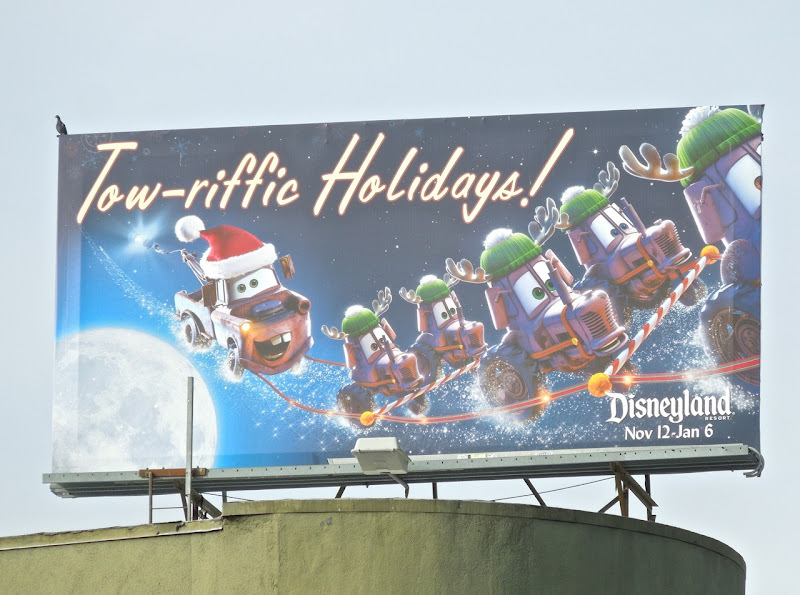 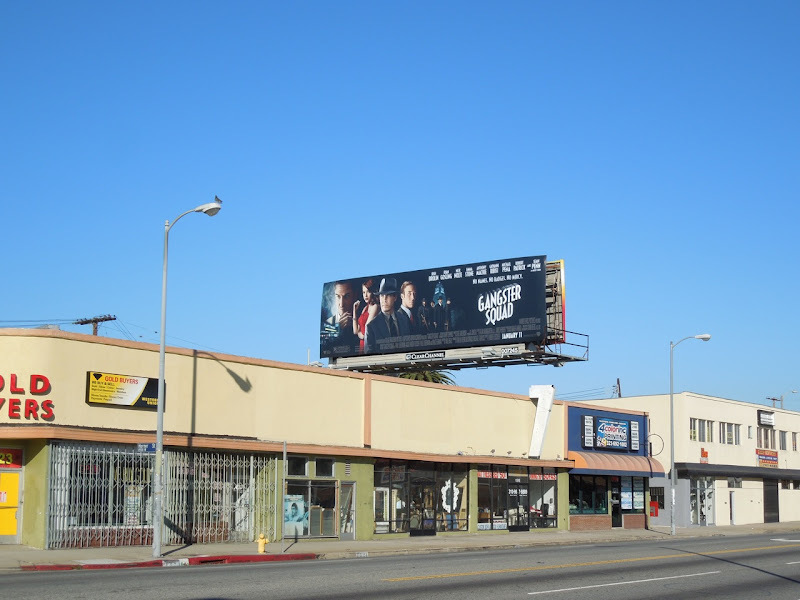 This movie billboard with its modern Western feel was spied along Beverly Boulevard on December 19, 2012. 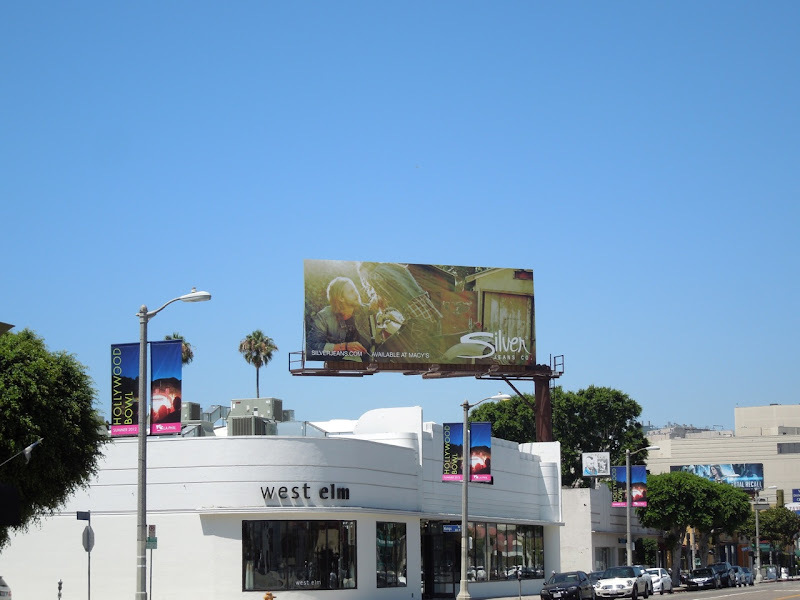 For more Western-themed billboards check out these Hell on Wheels TV billboards.